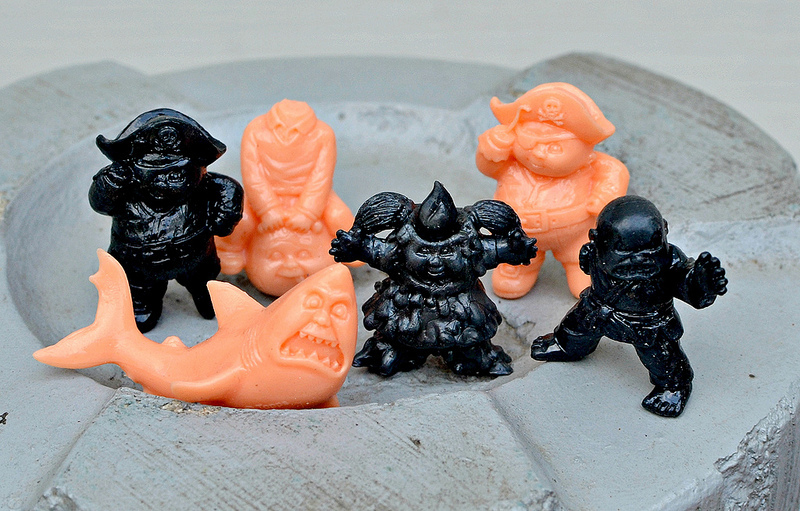 The second series of Topps' Garbage Pail Kids MiniKins mini figures is finally out! This new set was initially supposed to be released in March as the follow up to last Fall's first series, but got delayed until June. I was beginning to get a little worried as June neared and there was still no official announcement from Topps about the line, but thankfully they finally began to trickle out in stores. The peach color, which is no doubt a nod to the similar color used in classic '80s mini figure lines like MUSCLE and Garbage Pail Kids Cheap Toys, is only available in "hobby" boxes of MiniKins. That means that you can only get it in packs sold at comic shops, card shops, and places like that. It takes the place of the yellow-colored figures, which are only available in retail packs (for example, ones bought at Target). I think it looks great! So far I've been lucky enough to score not only a few peaches, but also a few super rare blacks! Also following suit with Series 1 is the way the figures are packaged. 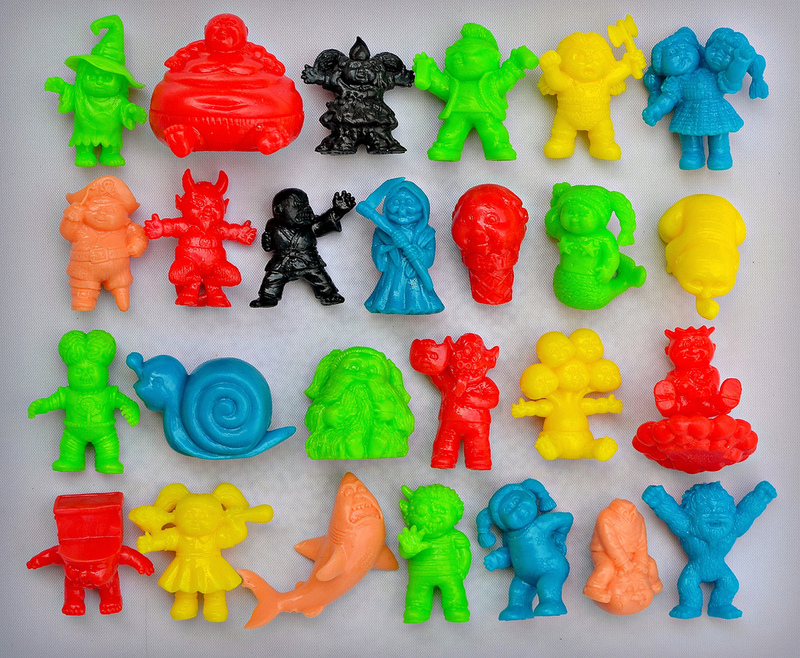 Once again, they are available in blind-bagged two-packs (each including one painted and one mono figure) as well as "jumbo" four-packs (containing one visible painted figure, one hidden painted figure, and two hidden mono figures). 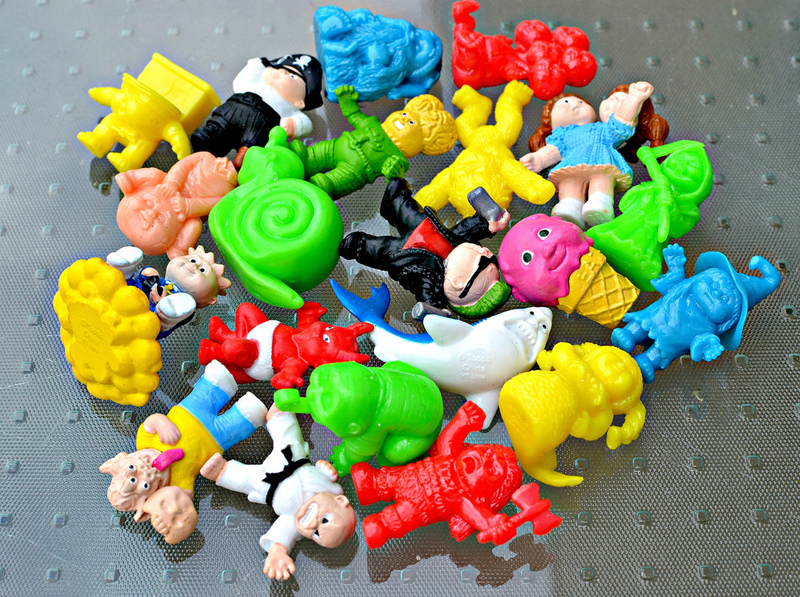 I can't help thinking these toys would attract more attention from kids and adult collectors alike if they were packaged more like Trash Pack multi-pack figures--where there are 5-to-12 figures per package, with a few being visible--but we may never know. The new packs also still include little character stickers that correspond to each of the figures and include funny character bios on the backs. Sculpt and character selection-wise, I'd say Series 2 is an even more interesting group than Series 1, and I might even prefer it. Once again, there are a few characters who were also released as GPK Cheap Toys back in the day, including Double Heather, Graffiti Petey and Fishy Phyllis. I'm a fan of the Cheap Toys, but I personally think these characters look even better in their MiniKin sculpts (especially Petey and Heather). 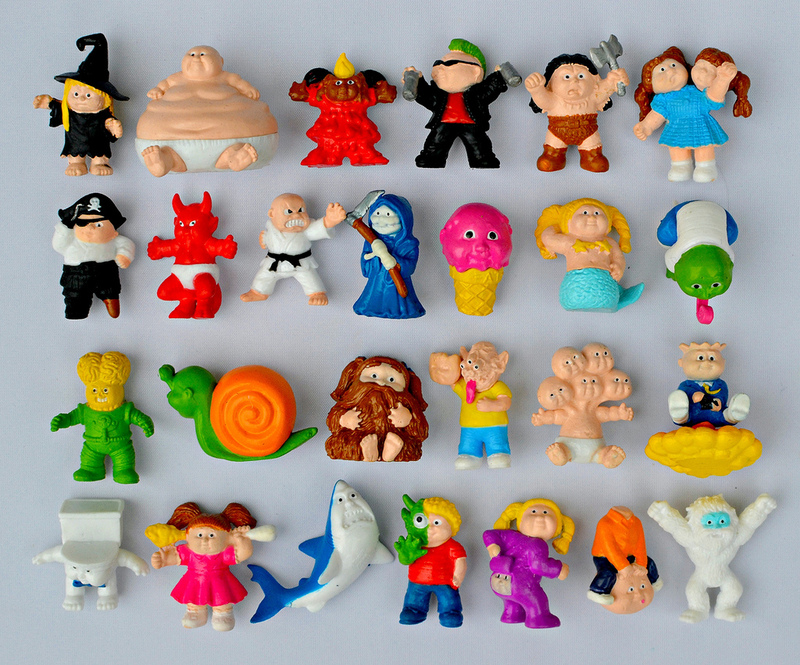 We've also been treated to a bunch of other iconic GPK characters that hadn't yet officially been released in mini figure form, including Weird Wendy, Slobby Robby, Outer Space Chase, Karate Kyle, Grim Jim, Mad Mike, Oozy Suzy, and Michael Mutant. Then, there's some more oddball/unexpected characters like Clark Shark, Yeti Eddie, Mushy Marsha and Pete Seat. As with Series 1, the sculpts take some liberties with the characters as compared to their card artwork. For example, Mushy Marsha is upright in her ice cream cone instead of sideways and splattered. I think that's to be expected when dealing with figures that are just around one inch tall, though, and it doesn't really bother me. Overall, I'm very pleased with the second series of MiniKins and wish the line would carry on to a Series 3 and beyond. These things are really fun and give me almost the same feeling I used to get opening up packs of Monster in My Pocket, MUSCLE and other lines as a kid. Unfortunately, from what I've read, the prospect of more figures beyond Series 2 doesn't look great. I'll keep holding out hope, though! What about you? 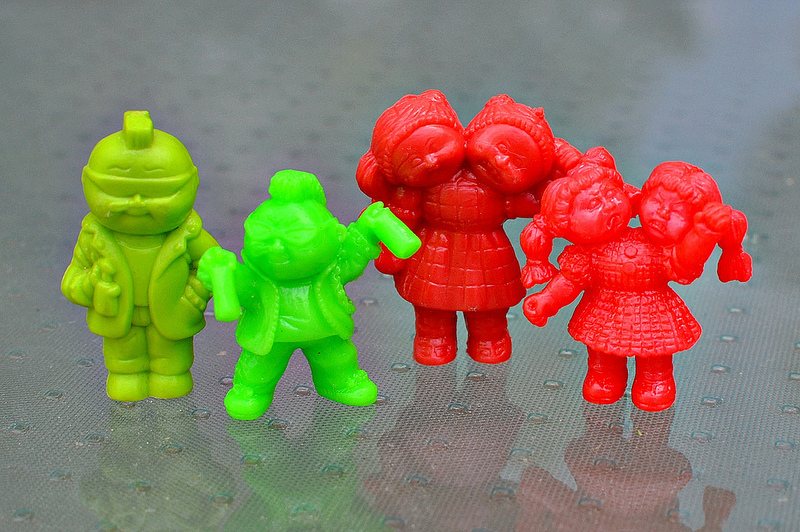 What do you think of the new batch of MiniKins? Some great characters in this wave. I've been tempted a time or two but haven't gotten any myself yet. Clark Shark is pretty great! I like Clark Shark a lot too--maybe because it kind of reminds me of those cool shark figure premiums they used to give away with Shark Bites fruit snacks! Oh man those were the best! I took one to school and for weeks during art class I would randomly pop him out of my pocket and say 'Landshark!' Trust me, it was hilarious. Haha that's awesome. I still have my white one from back in the day, but sadly it has red fade on it similar to what MIMPs sometimes get. I like series two, but there are so many other classic characters that could've been chosen. Yeah, but that would pretty much be the case with any group of characters they chose since there's just so many classic GPKs. I like that they mixed it up a bit, but do wish we'd have the chance to see more classic characters in future series. There are a couple of these that would be fun to have like Grim Jim or Pete Seat. You've got to include Slobby Robbie as well, if only for the fact that he's hollow and fun to squeeze, haha. So cool! Man, I still haven't gabbed any of these. Just just a little too pricey for just 2 minifigs. Where do you buy them? Did you get yours online? I think I would be more inclined to buy some if they came in bigger packs, like you said. 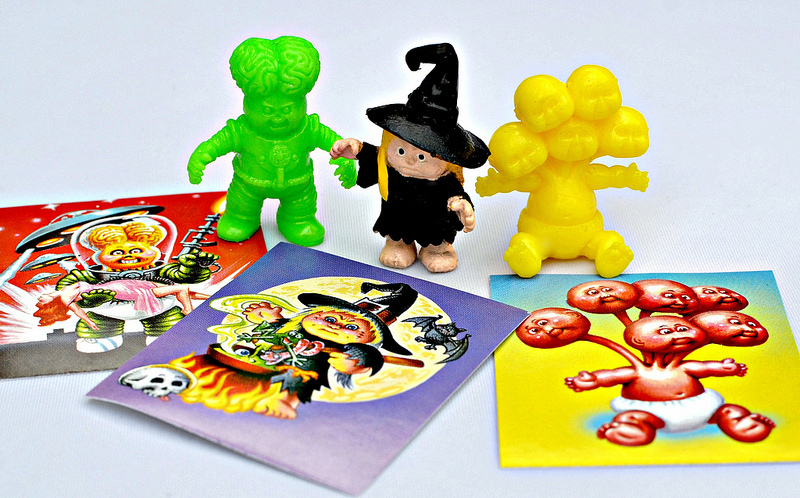 For the same amount of money I can get 10 GPK cards vs. just 2 minifigures. I may be comparing apples to oranges, but still. Maybe I should just buy one pack, just for the heck of it. Great pics by the way, thanks for sharing! Yeah, they are definitely too pricey, but I still buy them, haha. I ordered most of mine online, which added up to more like $1 per figure instead of $1.50. I actually haven't seen Series 2 in any of my local Targets yet. I wonder if my area is going to get them at all. I haven't seen a single thing of these in my area of Canada yet. I really want a Clark Shark though! Still nothing in Targets in the Chicago area, either. I got almost all of mine from online orders or trades. Series 1 was all over the place around here.